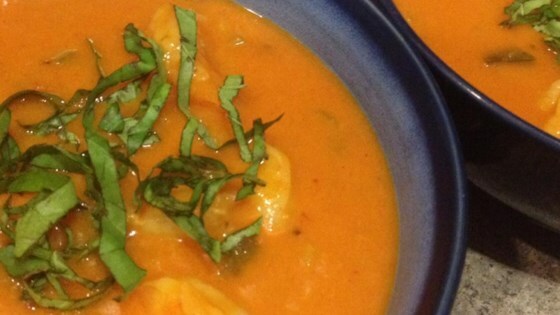 "I loved how this shrimp bisque turned out, and I think you will as well. I hope you give it a try, and maybe tweak it with some different combinations of seafood and garnishes." Melt 2 tablespoons butter in a saucepan over medium heat. Stir in shrimp shells; cook, stirring, until shells turn pink, 2 minutes. Pour in water and bring to a simmer; cook 20 minutes. Remove from heat and set aside. Melt 2 tablespoons butter in a large saucepan over medium heat. Stir in green onions, celery, and jalapeno; cook, stirring, until mixture is slightly softened, about 5 minutes. Reduce heat to medium low, stir in flour and cook 3 minutes. Pour tomato soup into onion mixture; stir to combine. Pour shrimp shell mixture through a mesh strainer into tomato soup mixture. Increase heat to medium-high and bring to a simmer. Stir coconut milk, red curry paste, and fish sauce into tomato soup mixture, bring to a simmer and cook for 15 minutes. Stir in shrimp, decrease to heat to low and simmer until shrimp are cooked through, 3 to 4 minutes. Ladle bisque into bowls, place a rice cracker in the middle, and top the cracker with sliced basil. It was just ok. Flavor was overly dominated by Campbell's tomato soup. I'd try it again with a base made from fresh tomatoes. My husband and I loved this dish. We like spicy food so we added extra peppers and used the hot red curry paste. It added extra flavor. This recipe is stupendous... Thought I'd give it a shot despite the fact that not many people had rated it. It's wonderful. Chef John scores again!! OMG delicious. Tweak as you want but why fiddle with perfection?! Thank you Chef John for another very tasty recipe! I omitted the flour to avoid the extra carbs and added 2 fresh diced tomatoes and the result was delicious. My husband and I both loved it.